Pocahontas is considered not only one of the most influental broodmares of all time, but one of the most influential thoroughbreds of all time, male or female. Mighty little Pocahontas produced three outstanding sires, two of which were champion leading sires, and five significant broodmares in the mid-1800s. The male line of her greatest son, Stockwell, dominates the breed through his direct male line descendants Phalaris, Nearco, and Native Dancer. This truly remarkable broodmare was from the first crop of foals sired by the outstanding runner *Glencoe. Possessed of both brilliant speed and great stamina, *Glencoe won the 2,000 Guineas and Goodwood Cup as a three-year-old. The next season, he won the Ascot Gold Cup and went unchallenged for The Whip. At the end of his racing career, *Glencoe was sold to James Jackson of Alabama, but stood his first season, 1836, in England before being exported to America where he became one of the most important sires of the century. 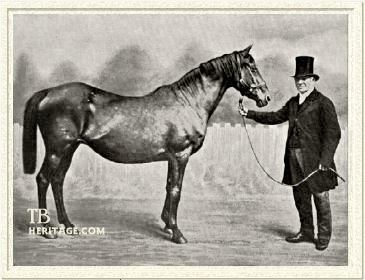 Had Glencoe left only this single filly born in 1837, his importance in the breed would be sealed. 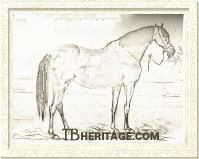 As it was, he became the leading sire in America eight times, and left an influence in male line through his son Vandal that became a pillar of the American breeding scene in the late 1800s, extending down to the great Hanover and his son Hamburg. Glencoe's daughters were even more important in the scheme of things in America, but his greatest producing daughter, Pocahontas, was a member of that singular crop born in England after he had departed across the Atlantic. Pocahontas' dam was the good racemare Marpessa, winner of Newmarket's Nursery Stakes at age two, and at age three winner of Goodwood's Racing Stakes and of a match at Newmarket against the Oaks winner Vespa. Marpessa became a broodmare in the Royal Stud at Hampton Court and was one of the mares bred to *Glencoe in 1836. Upon the death of King William (IV) in 1837, the Hampton Court Stud was dispersed, and Marpesssa, with a bay *Glencoe filly at side, brought 230 guineas from Lord Stradbroke. The filly, named Pocahontas, was her first foal. Marpessa's subsequent foals would include the 2,000 Guineas winner Idas (by Liverpool), as well as Jeremy Diddler (by Jerry), and Boarding School Miss (by Plenipotentiary). When a yearling, Pocahontas was sold for 62 guineas to John Greatrex, who raced her with his partner, trainer John Forth. She made only one start at two, and that a third in the Criterion Stakes behind the pair of Gibraltar and Crucifix, who dead-heated for the win. This form proved highly indicative of class, since Crucifix opened up the next season with wins in the 1,000 Guineas and 2,000 Guineas before meeting Pocahontas again in the Oaks. Making her season debut in the mile and a half classic, and going off as favorite, Pocahontas could only finish fourth, apparently compromising her performance with less than exemplary behavior. Later that season, in the Goodwood Cup, she was fifth in a blanket finish against some of the best males in training, with Beggarman the winner. At four, she ran three times, but ran unplaced behind Charles XII in the Goodwood Cup, then unplaced again in the Cesarewitch (giving significant weight to the winner). Between these two races, Pocahontas changed hands, sold to Mr. William Theobald. Following the Cesarewitch, she showed some improvement, placing second in three more tests at four and five, including victory in one heat of a five furlong plate without taking the win. She'd shown some class, but in her nine starts, she'd been unable to win. Pocahontas may have been run over her head, but it may also be that her ability was compromised by being a "roarer," or "broken in the wind." This is a respiratory problem that in this case may have been passed down through the female line for at least three generations, as both Marpessa and her dam Clare were also said to be roarers. Theobald was the owner of Stockwell Stud, in the village of Stockwell, near Clapham, on the south side of the Thames and now well within the sprawl of Greater London. He bred Pocahontas to one of his home stallions, Camel, as a five-year-old. A bay with a star on her forehead, she was a very small mare, said to be only 14.3 hands, but was well made, lengthy, with an excellent shoulder and hindquarter, straight legs with good, and showing some quality. Her main faults were a questionable temperament and being a roarer. Her first foal, CAMBAULES (b.c. 1843 by Camel) could only place, but he was also said to have been a roarer, which may have compromised his ability. Barren in 1844, in 1845, Pocahontas foaled a colt by Muley Moloch which was never named, never raced, and again, was reported to be a roarer. In 1846, she produced the bay filly Dolly Varden (by Muley Moloch), who became her dam's first winner, albeit a modest one, with but a single win to her credit. The GSB notes that Dollly Varden had a bay colt by The Fallow Buck in 1855 and was "sold to M. Shickler, and sent to France, covered by Y. Venison." Nothing more is heard from Dolly Varden. Barren again in 1847, the next foal from Pocahontas was INDIANA, a brown filly born in 1848 and sired by Muley Moloch. Indiana was unplaced and her only foal of importance was Humming Bird (f. 1859 by Birdcatcher), who was unsuccessful and sent to France in 1872, carrying Keepsake (f. 1873 by Gladiateur). The line continued through a tenuous thread. Keepsake's daughter Katia (1883 by Guy Dayrell) was the dam of Kasbah (1892 by Vigilant), who won the Prix de Diane (French Oaks) and returned greatness as the dam of several important daughters. The best of these was the outstanding racemare Kizil Kourgan, herself dam of the Arc winner and important sire Ksar (sire of Tourbillon), and granddam of 1,000 Guineas winner Kandy. Kasbah also produced Kizil Sou, granddam of another Arc winner and good sire in Kantar. Kasbah had a third daughter named Kizil Koum, granddam of Kiss Curl among others. 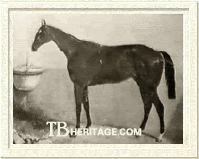 Following INDIANA, Pocahontas produced STOCKWELL, a flashy colt foaled in 1849 and sired by Theobald's sire, The Baron. Quite unlike his dam, he was a big, sturdy chestnut with a blaze and hind stockings, more similar in color to *Glencoe than the diminutive bay Pocahontas. Alternately described as ugly or full of quality, his hulking size was apparently offensive to many observers. There is also disagreement about his temperament, descriptions of which say he was a gentlemen, while others relate something less well mannered. King Tom, 1851, leading sire twice He impressed the Marquis of Exeter, however, who purchased him as a yearling. 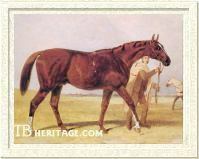 Racing for Lord Exeter, Stockwell won the 2,000 Guineas and St. Leger among his many victories. Exeter sold him in 1855 to Lord Londesborough. As a stallion, Stockwell earned the title "Emperor of Stallions," sired the winners of 17 classic races, and was the champion sire seven times. His greatest racing son was Blair Athol, but others included Doncaster (through which comes Bend Or, Ormonde, Teddy, and Phalaris), St. Albans (sire of Springfield), and Lord Lyon (sire of Minting, Touchet). Although he did not exhibit the family tendency to become a "roarer," Stockwell had a reputation for siring more than a few horses with wind problems. In 1850, Pocahontas foaled another colt by The Baron. Named RATAPLAN, he was also a dark chestnut like his sire, and had noticeable white ticking throughout his coat, a legacy of The Baron's sire, Birdcatcher. Rataplan had a star and a couple of white feet front and back. At 16 hands, he was a powerfully built horse like Stockwell, and inherited The Baron's utter vileness to a much more marked degree than Stockwell. Rataplan was also noted for having long, "proppy" pasterns and a correspondingly upright shoulder, conformation flaws that made him clumsy and slow getting started. Once he got rolling, however, Rataplan was resolute, and the longer distances proved much to his advantage. He was a stout runner and an outstanding stayer, winning 42 of his 82 races, including the Doncaster Cup, Cambridgeshire Stakes, and Ascot Gold Vase. He was fourth in the Derby and third in the St. Leger in the year West Australian won his Triple Crown. Although a successful sire, in fact, appearing in the top ten sires on five occasions, he could not even approach the record of his older brother. His best runner was Derby winner Kettledrum (sire of Cymbal, Trombone, and Lady Langden, dam of Hampton), and he also sired Irish Derby winner Ben Battle sire of Tragedy, Bendigo), Blinkhoolie (sire of Wisdom), The Miner, Elland, and The Drummer. Rataplan's daughters proved superior broodmares, however, and included Mineral (dam of Kisber and Wenlock), Hasty Girl (dam of Kilwarlin, Bendigo), Rigolboche (dam of Cremorne), Mandragora (dam of Apology), Quick March, Ratcatchers Daughter, *Lady Lumley, and Milliner (dam of *Pizarro). Taunton notes that "Pocahontas foaled RATAPLAN on the very morning of the day on which Mr. Theobald died. ", although an obituary for Theobald shows he died in October of 1849. Theobald's bloodstock was sold and Pocahontas went to Captain Thelluson for 260 guineas. That spring, she foaled a bay colt by Harkaway which was named KING TOM, who had a star and white feet behind. He was not a robust horse like his brothers, had some soundness issues (weak hocks), and did not stay as well. King Tom won two of his three races at two. In his only start at three, he was not quite recovered from an injury and ran second to Andover by just a neck, defeating Guineas winner The Hermit for the place. The effort knocked him out for the rest of the season with a tendon injury. He returned at four with a win, but broke down and was retired following the Cesarewitch Handicap. Having more brilliant speed and a kinder nature, KING TOM was a better sire than RATAPLAN, leading the lists in 1870 and 1871, but was nothing as successful as STOCKWELL - few would ever be able to match up to that. King Tom sired Derby winner Kingcraft, triple classic winner Hannah (1,000 Guineas, Oaks, St. Leger), Oaks winners Hippia and Tormentor, 1,000 Guineas winner Tomato. Despite all these classic winners, his most important foal was undoubtedly his daughter, St. Angela, dam of St. Simon and granddam of Orme (out of St. Simon's sister, Angelica). King Tom sired numerous other important broodmares besides St. Angela. Queen of Cyprus produced Oaks winner Limasol; Zephyr was the dam of Favonius; *Princess produced Royal Hampton; and other good ones were Jeu de Mots, Belle Agnes, and Queen of the Vale. *Princess, *Camilla, and *Lady Mentmore were foundation mares for August Belmont I in America. Several of KING TOM'S sons also did well as sires in America including *Phaeton (sire of Ten Broeck, King Alfonso, Lisbon), *King Ban (sire of Ban Fox, Jewel Ban), *Great Tom (sire of Tyrant, Advance Guard), and *King Ernest (sire of King Eric). Another son, Tomahawk, got the important producer *Cinderella (dam of Hastings and Plaudit). Son King Lud was a good sire in France. Pocahontas still had years to go as a productive broodmare, and her youngsters foaled after 1852 also had a major influence on the breed. In 1852, Pocahontas foaled STROOD, a chestnut colt by Chatham. This one was injured when still a young horse and never won a race. That year, with STOCKWELL winning everything in his path, his owner, the Marquis of Exeter, went back to the source and bought his dam, now 15 years old, to his stud in Newmarket. Barren for 1853, the next year Pocahontas produced AYACANORA, a chestnut filly by Birdcatcher, and so closely related to Stockwell and Rataplan, sired by Birdcatcher's son, The Baron. AYACANORA won the Hopeful and Newmarket Column Stakes. Ayacanora was a proflic producer. Her best runner was Chattanooga (1862 by Orlando), winner of the Criterion Stakes and most important to pedigrees as the sire of the stallion Wellingtonia, whose dam was ARAUCARIA, yet another daughter of Pocahontas. Ayacanora's daughters included Cachuca (1860 by Voltigeur) whose daughter *Castagnette was an important broodmare in America and ancestress of Dark Star, High Bid, and Bold Bidder; Nike (1864 by Orlando), dam of five stakes winners; and Cestus (1867 by Newminster), ancestress of the French Derby winner and sire Belfonds. Pocahontas' next foal was KNIGHT OF KARS, a bay colt born in 1855 sired by Nutwith. He was a winner, but not much more than that. His son The Colonel won the Grand National Steeplechase two times, and he appears in the pedigrees of some steeplechasers, including Grand National winner Zoedone, a daughter of his son, New Owestry. He also sired a few useful broodmares such as *Stolen Kisses, dam of the good American stakes winner and sire Reform (by *Leamington). In 1856, Pocahontas produced a full sister to Knight of Kars, a bay filly by Nutwith named HEROINE OF LUCKNOW. She never started, but produced the colt Warlike (by Weatherbit), and the mares Selina (by De Clare) and Amethyst (by Ambrose). Seline became the dam of Caterer, and third dam of Clamart. Amethyst was sent to Australia where she was a good broodmare, the dam of Amethyst and Sapphire, the latter by The Drummer, a son of RATAPLAN. Pocahontas was barren again in 1857. In 1858, she foaled KNIGHT OF ST. PATRICK, a bay colt by *Knight of St. George. Although afflicted with the family trait of being a roarer, Knight of St. Patrick won four races, including two stakes. 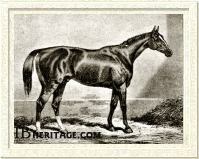 He was a useful sire as well, getting Moslem, winner of the 2,000 Guineas in 1868. He also sired the mare Beachy Head, from whom descends Bill of Portland and Solario. 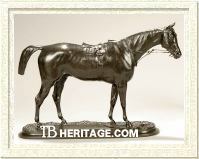 From life bronze of Auricula Barren in 1859 to the cover of Knight of St. George (who was shortly thereafter sent to America), Pocahontas had a bay colt in 1860 by Ambrose named AUTOMATION, a good runner. His three wins were highlighted by victory in the Abington Mile, which included Macaroni in his beaten field. Automation died as a three-year-old in 1863. In 1861, grand old Pocahontas produced AURICULA, a brown full sister to Automation, sired by Ambrose. Following Stockwell, she became the second classic winner produced by her dam, and the second St. Leger Stakes winner as well. As a broodmare, Auricula foaled Nuneham (1869 by Oxford), whose name appears in a few pedigrees as a sire of broodmares, but she had no daughters to carry the line forward with distinction. Pocahontas gave birth to her last of 15 foals in 1862 when 25 years old. It was the bay filly ARAUCARIA, by Ambrose, who was unraced at two, but at three won the Stamford Plate (10 f.) defeating Siberia, winner of the 1,000 Guineas. Araucaria was also a roarer. She became an outstanding producer in both England and France, foaling 1,000 Guineas and Oaks winner Camelia (1873 by Macaroni), 2,000 Guineas winner Chamant (1874 by Mortemer), and St. Leger winner *Rayon d'Or (1876 by Flageolet). *Rayon d'Or became an outstanding sire in America, where his progeny included champion filly Souffle, Futurity winner Chaos, Travers winner Liza, Withers winner Octagon, and many others, mostly for August Belmont II. Araucaria's son, Wellingtonia (by Chattanooga, see above, a son of Ayacanora), was a good winner and became a top sire in France. His most important offspring were Prix du Jockey Club (French Derby) winner Clover, and the mare *Plaisanterie, a stakes winner and second dam of the important runners and sires Tracery and Trap Rock. Wellingtonia was intensely inbred to both Touchstone (3x3) and Pocahontas (3x2). ARAUCARIA also produced the sires Blandford (by Bertram) and Apremont (by *Mortemer), the latter being sent to Australia where he became a top sire. Auracaria's daughter Gardenia (1871 by Macaroni) produced Petal (dam of Gossoon, a sire in Australia) and Golden Iris, the latter the second dam of Grand Prix de Paris winner Sans Souci II, and ancestress of Dante and Sayajirao. Pocahontas was bred six more years, but never had a resulting foal. Upon the death of Lord Exeter in 1867, she was put on the block with the rest of the Marquis' bloodstock. She was bought for 10 guineas by Exeter's heir, the third Marquis of Exeter and lived out her days at Wothorpe, part of the great estate at Burghley Park, near Stamford. Pocahontas died in 1870 age 33 years. A query to Jon Culverhouse, the curator of the collection of treasures at Burghley Park yielded this response: "All that is left of Pocahontas is a hoof, mounted in silver as an inkwell by Garrard and dated 1870." Recognized as a great producer in her lifetime, Pocahontas' vast influence on the breed became more obvious as the generations went by. Her sons Stockwell, Rataplan, and King Tom left sons and daughters of great importance, as have, to a lesser extent, her daughters. When Col. Vuilliers developed his Dosage System of breeding racehorses, Pocahontas was the only broodmare designated a "chef-de-race," as a direct result of her frequency in the pedigrees of great runners that came after her. She has even been fingered as a premier conduit of the alleged "X-factor" or large heart gene mutation. In any case, Pocahontas is hard evidence that big things can come in small packages.